Customize your listings. Target specific channel audiences. Only with Kigo’s Channel Manager. Customize your high-quality marketing strategy for every specific channel partner you use! Kigo’s Channel Manager lets you easily customize and adapt your marketing strategy according to the channel partners you use to distribute your properties to maximize your portfolio’s performance. Being able to syndicate your ad strategy allows you to attract the unique travelers in each channel, automatically handle channel commissions and have general ledger-style categorization for account integration. With different channels come different audiences and Kigo’s Channel Manager gives you the ability to focus on quality, not quantity. You can use fewer channels and boost performance at the same time. By focusing on the channel partnerships that are meaningful to your unique properties you can increase your performance per channel and share your marketing commissions, maximizing your revenue, minimizing expenses and mitigating risks. And you can create and test new marketing strategies offline with the Channel Manager Simulator. 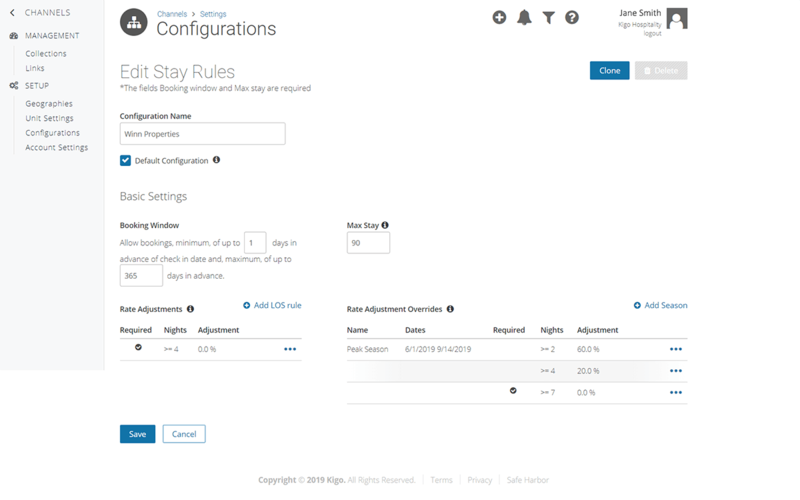 Kigo’s Channel Manager adapts restrictions based on urgency or shifts in demand, relaxes length-of-stay limits based on maximizing occupancy while allowing you to protect your margins. With all this data in your hands, you can shorten your minimum stay to fill the gaps, add rate adjustments to cover your management costs and make more revenue by optimizing your occupancy rate. We catalog items consistently with your accounting practices for ease of management and unpack hidden fees to unlock cost-prohibitive channels. Our new channel manager can help you deliver the data in a way that is easy to consume for accountants, while not overwhelming the guest or owner. 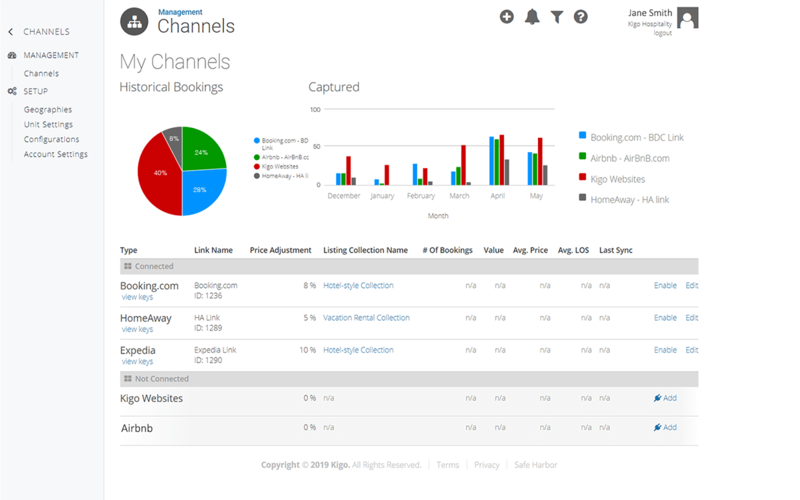 Increased bookings through customized settings such as length of stay, rates, and promotions set for each unique channel partner and their target audience. Streamlined accounting and synchronizing calendars through one single platform. The ability to adjust quickly to market trends so your rates remain competitive across marketing channels helping you earn more money. The power to protect your margins with itemized payment/cancellation policies, flexible commissions and optimized fees per channel. Here’s a list of some of our top Vacation Rental Channel Partners. Choose a vacation rental partner to learn more.